My choice of bedtime reading usually includes a cookbook. Rob actually reads novels. Books with chapters, a beginning, a middle and an end. When we packed for Colombia, we debated how many books to bring. I typically read 1 book while on vacation: my travel guide. Rob was adamant that he would likely read a bunch of books. In the end, we brought 5 books, including the travel guide. After 2 weeks, I had read the travel guide and 1 book. Rob had plowed through all the books. While I don’t read many novels, I really enjoyed my book: The Fortune Cookie Chronicles. It is a collection of short, thought-provoking essays about American culture through the eyes of Chinese food. Lee starts off by exploring people’s thoughts on fortune cookies after a national lottery gets pummeled with too many winners- they had all picked the same numbers from a fortune cookie. In a dizzying around-the-world tour-de-force, Lee visits the home of the real General Tso, puzzles together the origins of chop suey and the first fortune cookie and crowns the world’s greatest Chinese restaurant. This isn’t a flippant ready-for-the-masses book, though. It is smartly written in an accessible manner. Have you ever thought about the dangers of being a delivery person? Or the lives affected through human trafficking? Or why the Chinese food in the US cannot be found in China? To be honest, I did not really like Chinese food take-out but as a child, we had the occasional visit to the local Chinese restaurant. I can see how Chinese food helped to embrace the worldly culinary culture we now have. With its emphasis on saccharine-sweet and cornstarch-goopy sauces, I haven’t been to a Chinese restaurant in ages, though. I have made a handful of Chinese meals at home, usually healthier vegetable stir-fries, where I can reduce the sauce myself without cornstarch and keep any sweeteners to a minimum. For this month’s Random Recipes, we had to randomly pick a cookbook and cook the middle recipe. My chosen cookbook was Moosewood Restaurant Cooking for Health and at 348 pages, the middle page was 174. No recipe on that page. I rounded down to find the first recipe: Cabbage with Fermented Black Beans (page 171). No stranger to stir-fries with fermented black beans, I thought this looked like a great recipe to try. However, a meal it wasn’t, so I tweaked the recipe to include julienned five-spiced seitan, as a nod to my favourite Braised Cabbage with Chorizo Seitan Sausage. I am really digging veggie-centric stir-fries lately, and this was no disappointment. Quick to put together, dinner was served in under 20 minutes. The fermented black beans add the depth of flavour ones expects from authentic Chinese food which is highlighted with rice vinegar and sake. The ginger and garlic add a nice hit of flavour and feel free to add Chinese chili paste if you want it hotter. 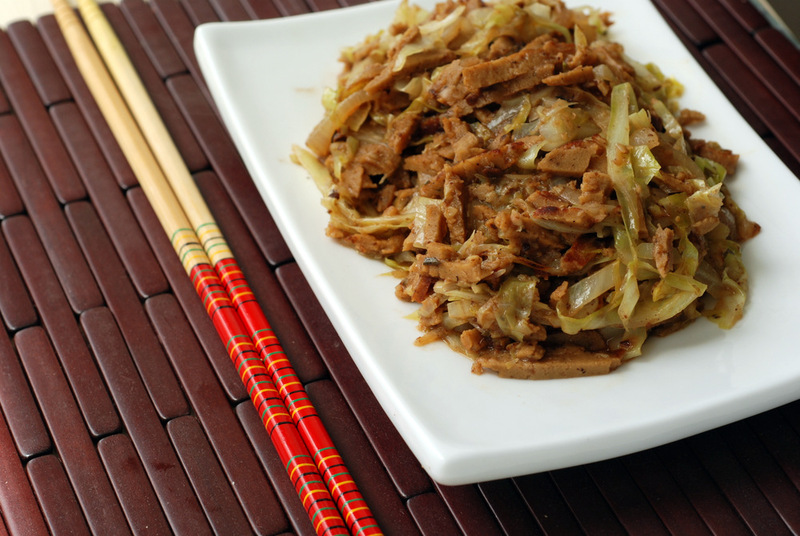 The Chinese five-spiced seitan was a perfect complement to the wilted cabbage, conferring sustenance to the dish with a major protein component. So, tell me. Did you grow up eating Chinese food? Do you still eat it? What is your favourite Chinese recipe? This is my submission to this month’s Random Recipes, to this week’s Weekend Wellness and to this week’s Cookbooks Sundays. 1. Prepare your black bean sauce by combining the fermented black beans, water, sake, sesame oil, and vinegar in a small bowl. Mash the beans with a fork. Set aside. 2. In a large non-stick wok, heat the oil on high. Add the onion, garlic and ginger and stir fry for 30 seconds to release their aroma. 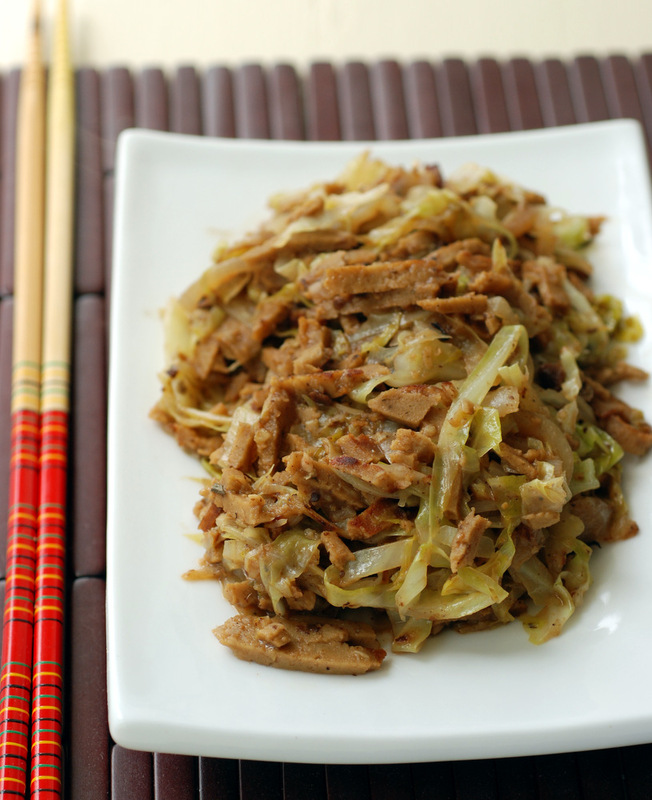 Add the cabbage and seitan and stir fry until the cabbage is tender-crisp, around 10 minutes, stirring often. 3. Pour the black bean sauce into the skillet and cook for 1 minute more, to combine the flavours without evaporating too much of the liquid. Season to taste (the fermented black beans can be very salty, so be mindful with extra salt). Serve immediately as is, or with brown rice, soba or udon noodles. That book sounds really interesting! I’m going to have to add it to me “to read” list! Chinese takeout was a treat in my house going up. Once every couple weeks we would get takeout, usually it was pizza but occasionally it would be chinese. We ordered the same thing every time- lots of szechuan dishes and spring rolls. I go still get it occasionally but I’ve definitely moved towards more Indian and Thai. This recipe looks so similar to a beef dish we always got, but obviously so much better because it’s vegan! I grew up eating bad Chinese take-out which I refuse to touch now. I’ve eaten REAL chinese food a few times, though, and it’s SO delicious! Really, the difference is astounding. that five-spice seitan sounds like the perfect addition to this! Yes, Chinese food definitely featured in my childhood, but it was very Westernised interpretations of many dishes I’m sure. Can’t remember the last time I ate Chinese though – I tend to more usually opt for Thai, Indian or Japanese. I certainly love this version of a stir-fry. I still haven’t cooked with black beans yet although I do use a jar of dried ones that I’ve had for ages as baking beans! I must give them a go this looks lovely…I’m a big fan of cabbage and I know how good fermented vegetables are for you. Definitely give this a try.. although black beans are different than fermented black beans. I think the fermented black beans are actually black soybeans.. and brined in a bunch of salt! Definitely a hit of umami. Yum!